Have you heard about the new playground in Stonefields? The Playtime Playground. It's close to a cafe and Stonefields School and is situated at the bottom of Mt Wellington. 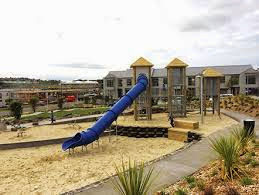 It is a new state of the art playground that is within half an hour of Aucklands CBD. You and your family should come and check it out! The new playground has some pretty cool features. The playground has a flying fox, a basket swing, a massive spinning top, and some others. The floor is made of sand and it's really soft. The playground has a mini - tower with a slide to slide off the tower. It has these mini - diggers which are pretty cool. Some features that I like are the basket swing, and the huge spinning top. I think those are really fun. The basket slide is held up with chains, and the chain is surrounded with rubber so it wouldn't hurt if you hold it. The cool thing about the spinning top is that you can control the speed of it spinning so if you sit on the spinning top, and you want to spin fast, then you could push it hard and it will go fast, if you want it to go slow, then you could push it lightly. Some features that I didn't like was the sand, and the speed of the flying fox. The reason I didn't like the idea of having sand instead of grass is because it gets in your shoes and you get full of sand. It is really hard not to get sand in your shoes! The reason I don't like the flying fox too much is because it doesn't go down a hill so it goes really slow. I would recommend the Playtime Playground to children from 2 - 13 years because the playground hasn't got games that would really interest people that are older than 13. And the games are probably not for 1 year olds or younger.